In my earlier article, I had discussed about the omitted leading zeros in excel and I received a very nice solution from Mr. Harsh, one of my blog readers. 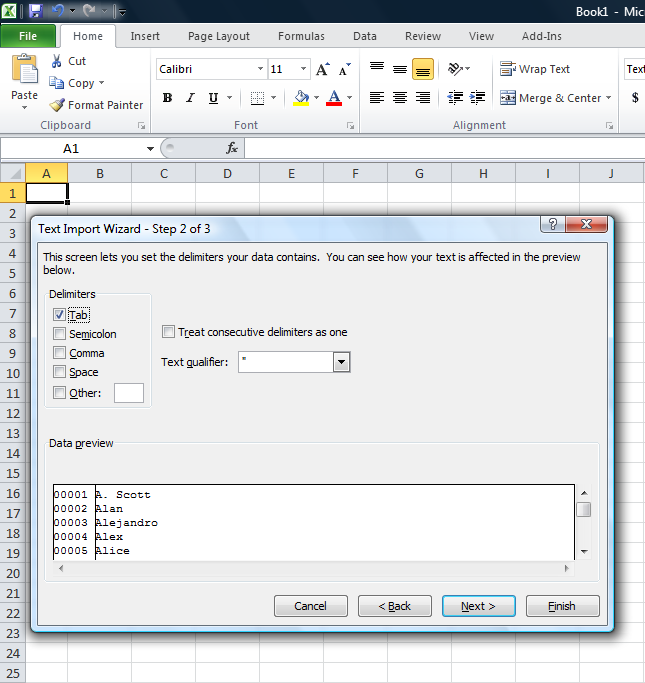 (This solution works in Excel 2010 and above). Let me explain his solution step by step. Let me create a sample to demonstrate the error. 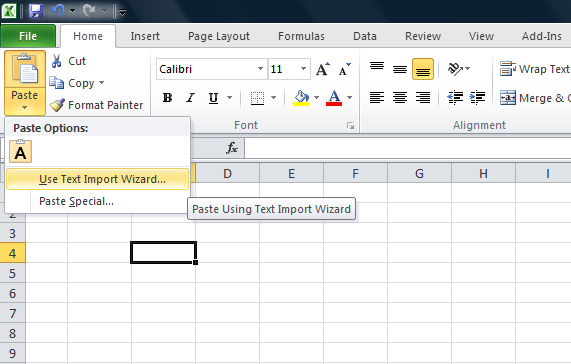 Copy the data from SQL Server, open an excel sheet, click on Paste Button and select Use Text Import Wizard (as shown in the picture below). It then takes you to 3 steps of Text Import Wizard. 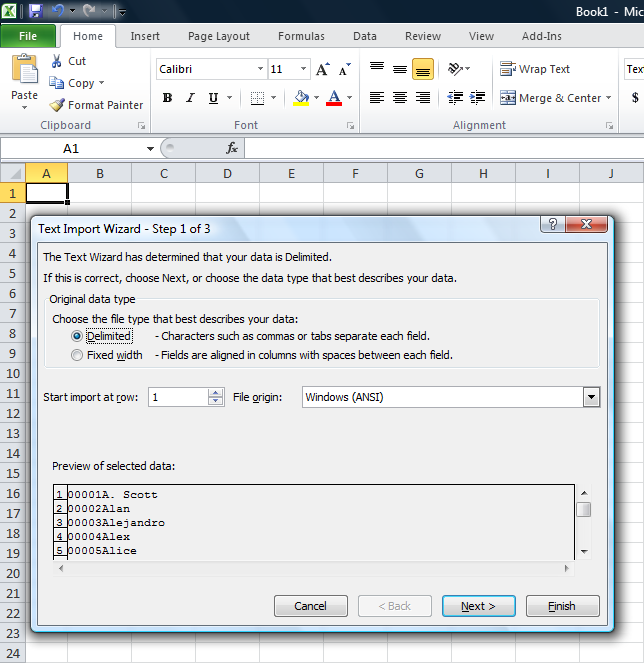 Under Text Import Wizard – Step 1 of 3, you need to determine the data type. Select Delimited and press Next (as shown in the picture below). Text Import Wizard – Step 2 of 3 lets you to set the delimiters your data contains. Select Tab and press Next (as shown in the picture below). 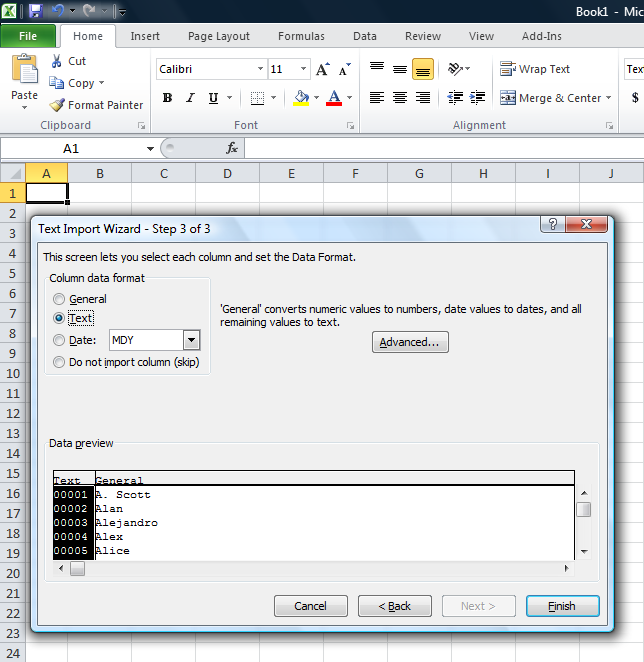 Text Import Wizard – Step 3 of 3 lets you set the column data format. Select Text and press Finish (as shown in the picture below). Once finished, the data would be pasted in the required format, meaning along with the zeros as shown in the picture below. Let me know if you know any better solution. IF… ELSE clause is very handy and whenever you need to perform any conditional operation, you can achieve your results using it. But there are some limitations in IF… ELSE, and one of the limitations is that you cannot use it in WHERE clause. Let me demonstrate the limitations. Incorrect syntax near the keyword ‘IF’. You can use CASE statement instead of IF..ELSE clause to do conditional where clause. In this solution, you can use IIF clause instead of IF..ELSE to do conditional where clause. In my earlier article, I had discussed about how to sort month names in month order instead of alphabetical order . In that article, we had given the date and we had to convert into month and sort it. But, in today’s case we have month & year in the table and we need to sort it in month & year order instead of alphabetical order. To achieve this, we usually use lots of case statements and sort it. Let me create an example to demonstrate it. As you can see, the above result set is not sorted properly. 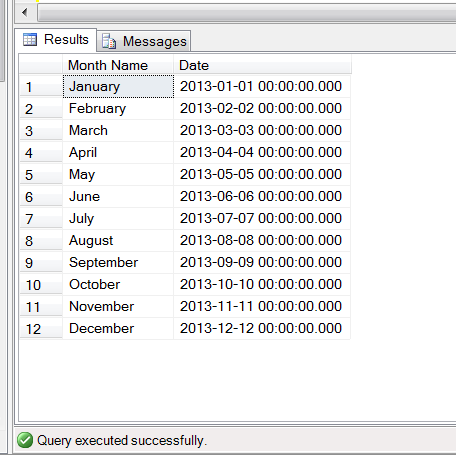 Given below is a simple solution to sort data in month and year order. In most of the applications, we create some multipurpose stored procedure that we use for multiple forms, reports, exports, etc. The challenge we usually face with this kind of stored procedure is that whatever columns are available in the result set, stored procedure will return the same number of columns as an output and not the selected/required information. Let me take a sample stored procedure from AdventureWorks2012 database and view its result set. 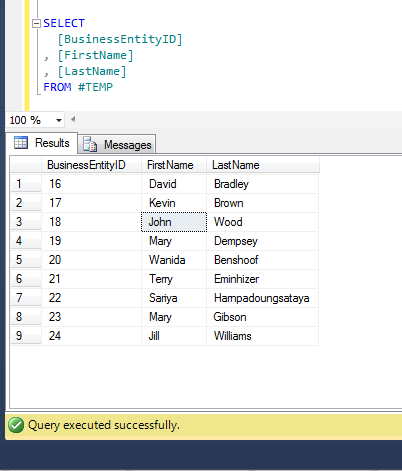 As you can see that a number of columns are available in the above stored procedure result set but I need to select [BusinessEntityID], [FirstName], [LastName] ONLY. 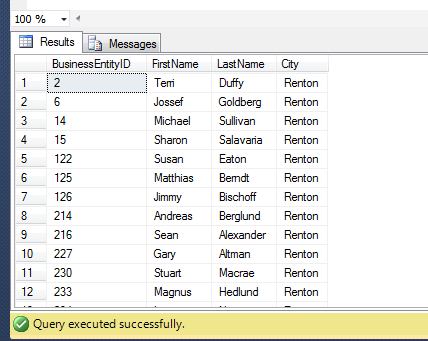 Create a temporary table according to the number of columns in the result set of the stored procedure. 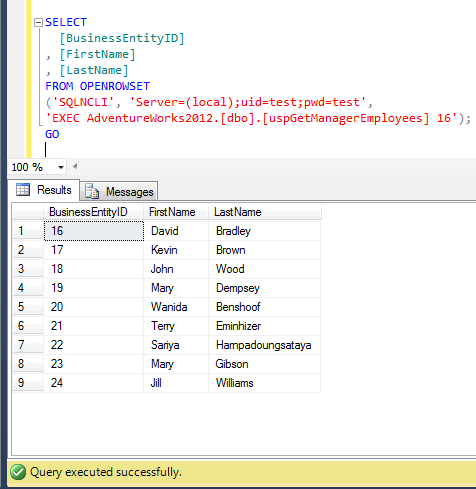 Insert the complete result set of the stored procedure in the table. Select the required columns from the temporary table. In this method, we need to use OPENROWSET and can select the column of the stored procedure result set directly. Most of the time, I find developers surrounded by hundreds of scripts and frantically looking for the required file amongst the open documents. And also, it is near impossible that you are using all the documents at once. So, how to avoid this issue ? 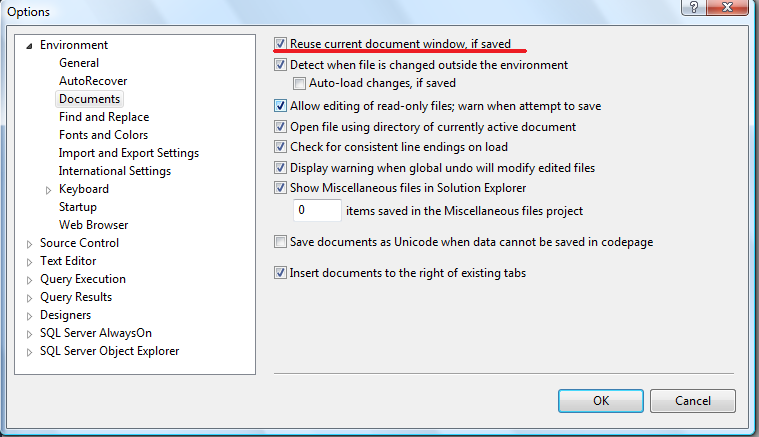 Tools >> Options >> Environment >> Documents, as shown in the given below screen shot. You just need to enable this option and once it is enabled, just save the script which you have finished editing, and click on new query. So it will close the saved script (document) and open a new query in the same place. 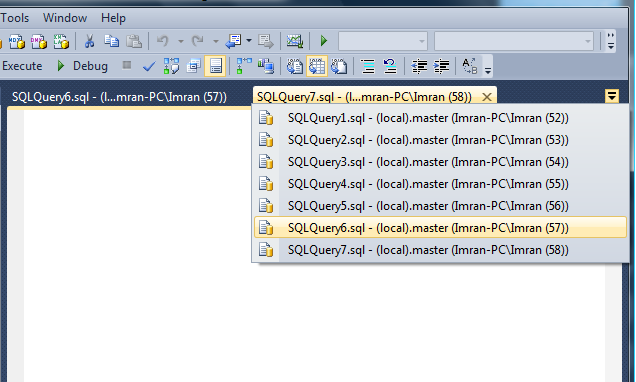 Note : All the above screen shots are taken from SQL Server 2012. How to sort month names in month order instead of alphabetical order is a common problem and has been discussed on multiple forums. But what encourages me to write this post is, I found new methods to do it. Let me create a sample to explain multiple methods to achieve it. 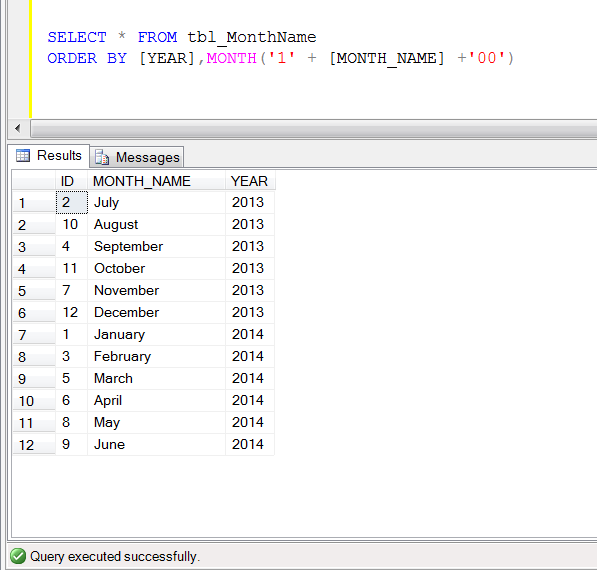 This is the simplest method, wherein you just need to sort on the basis of column [date] instead of DATENAME(month,Date). In this method, you need to get the month number using Month function and sort it on month number. 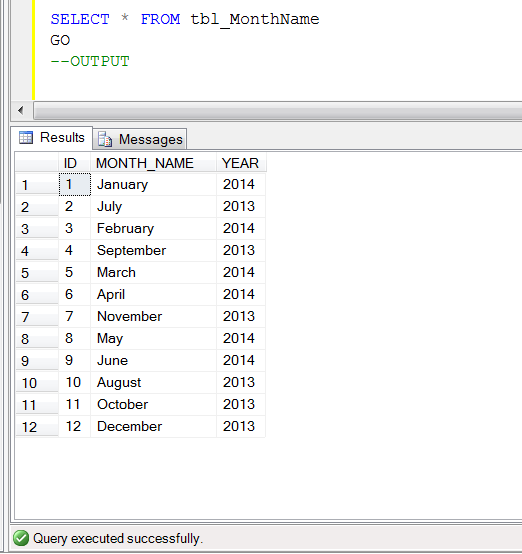 In this method, you need to get the month number using DatePart function and sort it on month number. 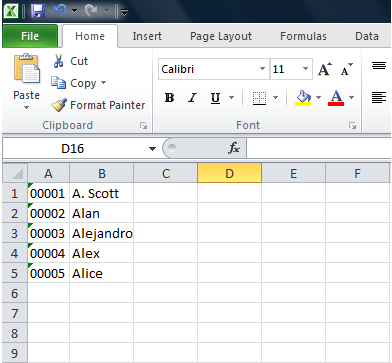 In this method, you need to get the month number using Format function and sort it on month number.